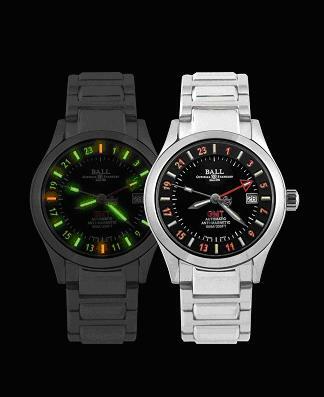 Movement is an automatic Ball Caliber B2002 (base ETA 2893-2) with 24-hour illuminating indication (second time zone). It has 54 micro gas (3H) tubes on the hour/minute/second hands and dial. This self-powered micro gaslight glows 100 times brighter than standard Tritium, lasting over 25 years. The case is anti-magnetic YUS190 quality stainless steel (can stand a magnetic field of 4,800a/m). It is water resistant to 100 meters. Dimensions are 40mm X 11.8mm. It features an AR coated domed sapphire crystal.